Your birth chart or horoscope, is usually shown in the form of a wheel, symbolising the cycles periodically undergone by all living things on this planet. The symbols ("glyphs") displayed stand for the astrological signs, planets and other chart factors representing forces which may affect your life at any given time. The basic structural components of the world are known as elements, modified, or flavoured by their modalities, or qualities. 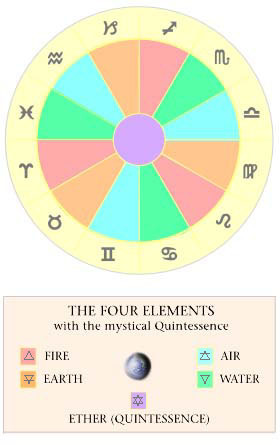 In astrology, four material elements are recognised: Fire, Earth, Air and Water (see table). Originally conceived by Empedocles in ancient Greece and identified as elements by Plato, they are easily observed in nature but have a subtle character, not to be confused with the chemical elements of the modern periodic table. The astrological elements are expressions of spiritual energies, rather than blind forces. Earth (material things & security). These elements are considered the building blocks of existence at all levels, the universal forces upon which life depends. They interpret a much broader range of experience than the "chemical elements" of modern science, and should not be confused with them. They are also known as the quadruplicities, or modalities. A fifth element, or quintessence, is the underlying spiritual essence out of which the four material elements are precipitated. The quintessence is not used in practical astrology, though the idea of a spiritual ground has been widespread in science since Aristotle. The quintessence, or æther, is central to spiritual development in many cultures. It is also known as the astral light, or the collective unconscious, and in yoga, the akasha, a sanskrit word meaning "shining". The karmic memory of nature is held to be stored in the akashic records. These features are known as the triplicities and are usually interpreted in conjunction with the elements or quadruplicities. The Fiery signs, for example, are Aries, the Ram (cardinal-fire), Leo, the Lion (fixed-fire) and Sagittarius, the Archer (mutable-fire). The other signs follow a similar pattern (see table). please click this link to go to our article on Elemental Qualities.